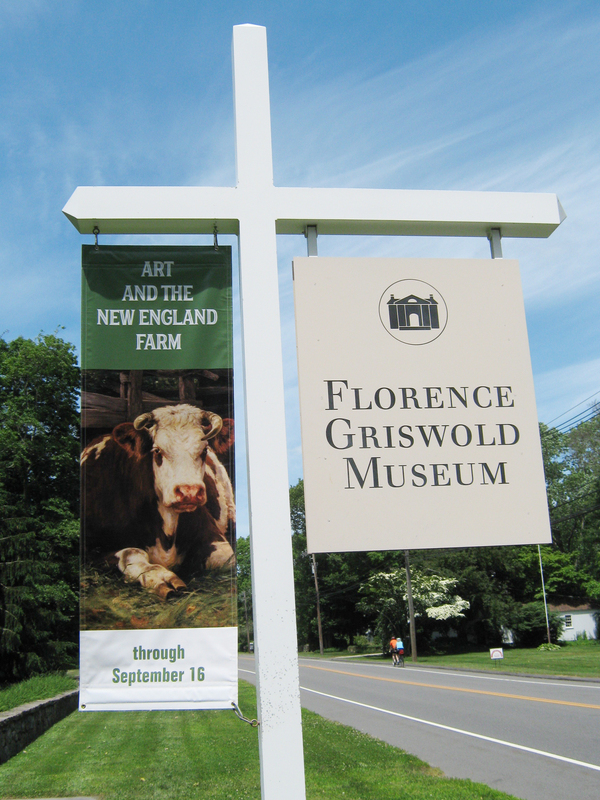 This summer’s exhibit, Art and the New England Farm (May 11-September 16, 2018) at the Florence Griswold Museum in Old Lyme (New London County), Connecticut confirms the museum’s importance as a destination for art lovers. 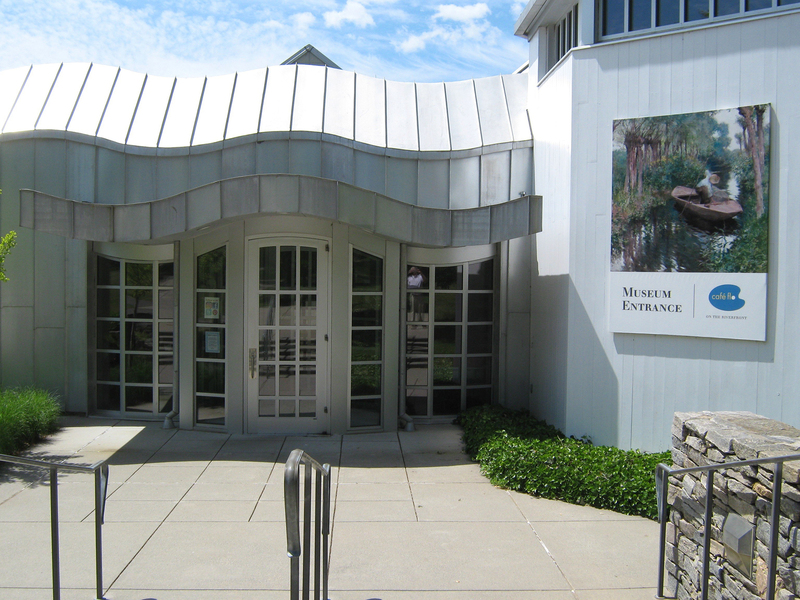 Located on the southeastern Connecticut coast at the mouth of the Connecticut River (halfway between New York and Boston), the museum has its roots in the Old Lyme Art Colony, which was at the center of American Impressionism at the beginning of the 20th century. At its height during the first 30 years of the 20th Century, 200 painters passed through the colony of artists. A brief history on the museum’s website describes a twist of fate. 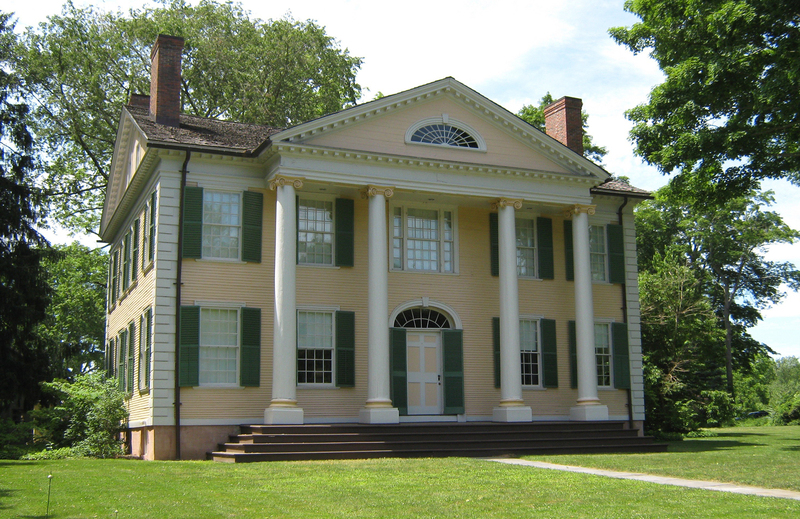 Florence Griswold, the youngest child of a once prosperous sea captain inherited the family home along with its debts. To survive, she chose to take in boarders. Fortunately, during the summer of 1899, one of her visitors was Henry Ward Ranger, a New York artist looking to establish an art colony in the New England countryside. Under Ranger’s leadership, Old Lyme was, for a time, designated the American Barbizon. With the arrival of Childe Hassam in 1903, the focus of the artists colony shifted from Tonalism to Impressionism and became known as the most famous Impressionist artists colony in America, the American Giverny. The Griswold family home was transformed into the colony’s boarding house, with the property’s barns and outbuildings turned into studios for artists. Grateful for Florence Griswold’s hospitality, artists painted on the walls and doors of the house, and this extraordinary artwork is preserved within the Florence Griswold House today, making the building itself one of the most important aspects of the collection. Also extraordinary is this summer’s carefully curated exhibit, Art and the New England Farm. The Florence Griswold Museum is a perfect venue for this summer exhibit. 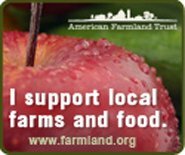 The Griswold family long pursued small scale agriculture, and one acre of the 15 acre property was a cultivated fruit orchard of 40 trees (plum, peach, cherry and apple). The artists who boarded with Florence Griswold feasted on delicious fresh food from the property’s small farm. Kudos to Curator Amy Kurtz Lansing for the informative and detailed labeling of the exhibit and artwork. Credit and recognition is suitably given to James Kent (1867-1931), the Irish born farm manager and the hired (mostly immigrant) farmhands, for their contributions to the sustenance of the artists colony. Artists must eat, and the Old Lyme Art Colony painters ate very well indeed. The paintings, wood engravings, drawings and photographs, included in the exhibit, are not only the work of artists associated with the Old Lyme Art Colony. The oldest painting, circa 1800, Ezekiel Hersey Derby Farm by Michele Felice Corné depicts the 110-acre (18th century) model farm in Salem, Massachusetts. And 21st century photos by Judy Friday show what goes on at a small New England dairy farm, Tiffany Farms in Lyme, season by season, in order to produce milk. A painting spotlighted in the exhibit, Seven Miles to Farmington, circa 1853, by George H. Durrie, is also the subject of a praiseworthy online learning resource developed by the museum (and supported by a grant from the Institute of Museum and Library Services) to connect art and history in the classroom. The mysteries behind this iconic work of American art are explored with the intent of changing the way the viewer (of any age) sees this Durrie painting. One emphasized detail of Seven Miles to Farmington is the canal in the background, which dealt a blow to New England agriculture by reducing the cost of shipping farm products from the west. In a recent book review of Homegrown Whole Grains by Sara Pitzer posted here last month, it was noted that upstate New York was the breadbasket of America until the Erie Canal in the early 19th century opened up the vast and fertile Midwest to cultivation. 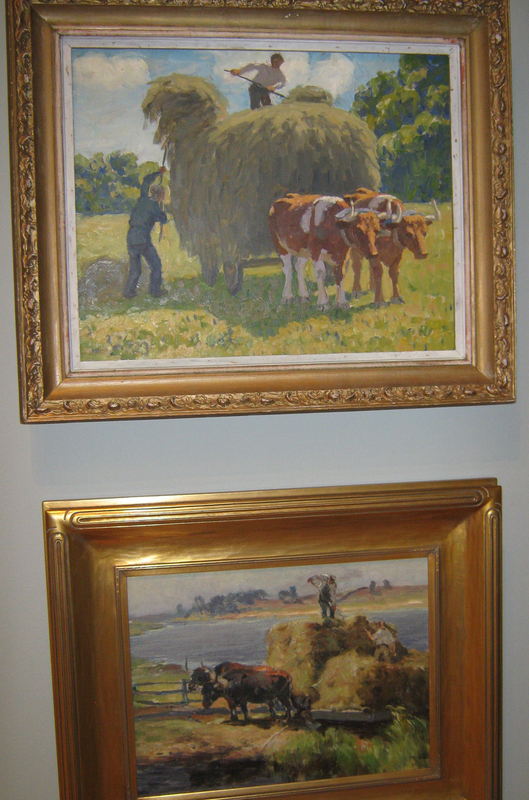 Past farming traditions such as salt haying, dependent on old-fashion methods since harvesters waited for dry summer weather and low tide to gather hay from the coastal marshes, are depicted in beautiful paintings. Working against time to cut the grasses and pile them on to gundalows (flat bottomed scows) that could be floated to a farmer’s land, was labor intensive since mechanized equipment could not be utilized. And the exhibit demonstrates that at the beginning of the 20th century with the establishment of the Old Lyme Art Colony, local agriculture in Lyme and its environs was in steep decline. The exhibit includes images of New England agriculture as hard scrabble and lonely. 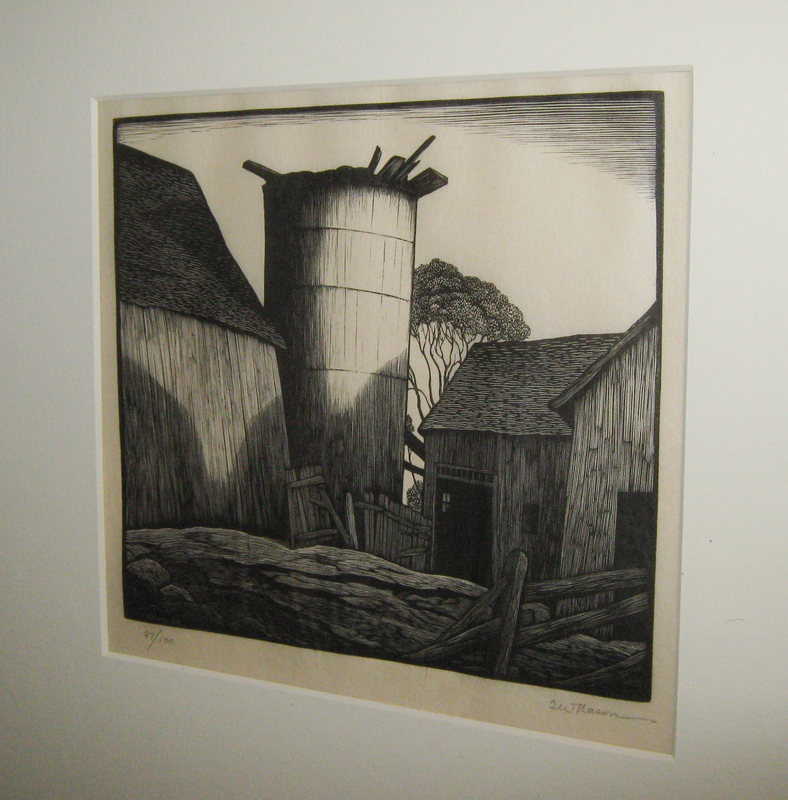 Thomas Nason’s wood engraving, A Deserted Farm (1931) depicts farm ruins he purchased and would slowly rebuild while living out the principles of self sufficiency, closely identified with New England farm life. 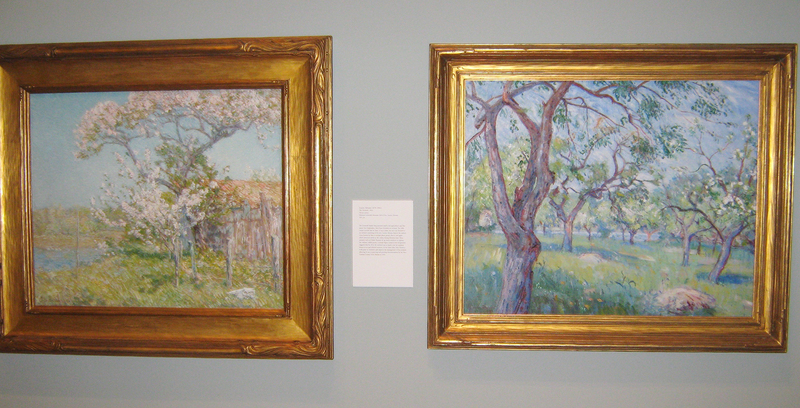 Similarly, John Henry Twachtman bought a 17 acre farm he discovered while touring abandoned agricultural properties. 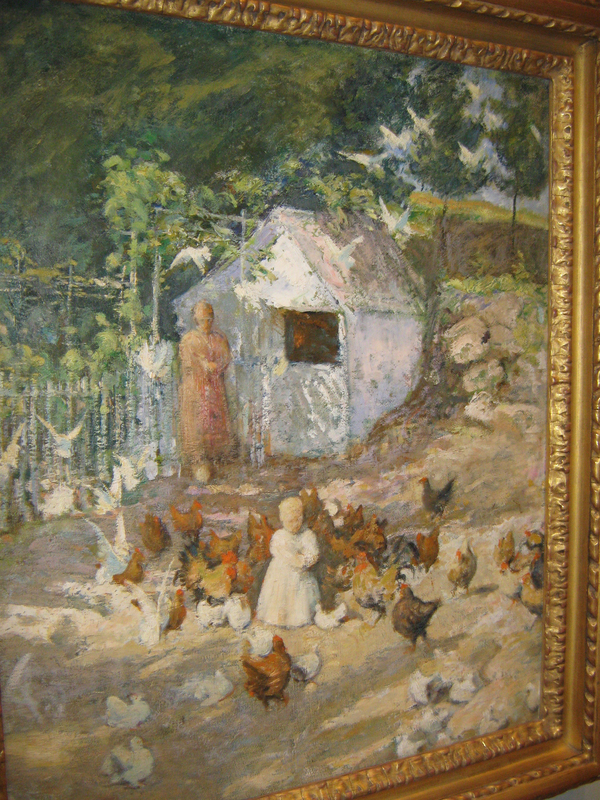 Twachtman’s painting of his daughter feeding chickens under the watchful eye of her mother is notable. Despite the decline in agriculture with the exodus from New England farms to cities or western lands, there are the inspiring paintings of fruit trees in bloom and an enticing still-life of Strawberries (1888) by Charles Ethan Porter. The informative label notes that Porter’s strawberries were a reliable new variety called The Wilson, which allowed large scale production of the delicious fruit. Art and the New England Farm is an exhibit to savor. A trip this summer to the Florence Griswold Museum in Lyme on the Connecticut coast is highly recommended.